Disgruntled Cleveland Cavaliers point guard Kyrie Irving has already made his preferred trade destinations known. The Miami Heat were one of the four teams on that list, but according to the Miami Herald‘s Barry Jackson, the Heat are not especially interested in acquiring the young All-Star. “While Miami is known to inquire when a star player becomes available, it seems as though the only way the Heat would have a real shot at landing Irving is if all other trade opportunities dry up. “And while the possibility certainly cannot be ruled out, the Heat does not have considerable optimism about being able to strike a deal, multiple league sources said. 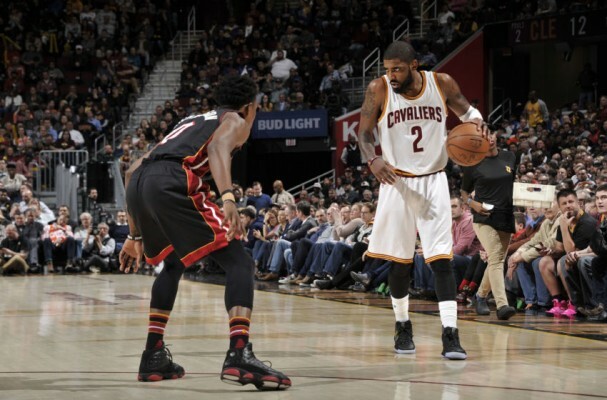 Of course, the Heat could offer assets like Goran Dragic, Wayne Ellington, and Justise Winslow in a trade for Irving, however that might not be enough, especially since the Cavs’ signing of point guard and former NBA MVP Derrick Rose means they do not necessarily need to trade for a starting point guard in return for Irving. That means they could go out and trade for the best players available, as opposed to players to fill the void Irving will leave behind. Jackson added one more wrinkle that makes an Irving to Miami trade unlikely. Sending a star player to a conference rival is one thing, but there’s no doubting that if the Cavs can help it, they won’t want to see yet another star player leave for South Beach. Right now it looks like the Minnesota Timberwolves and the Phoenix Suns are in the best position to land the disgruntled star, but as this entire NBA offseason has proven, that is all subject to change at any time. For the moment it looks like the Heat are happy with the roster they have, and will hope that the departure of Irving will make LeBron James and the Cavs a much easier opponent should they meet in next year’s Eastern Conference playoffs.